Guys! 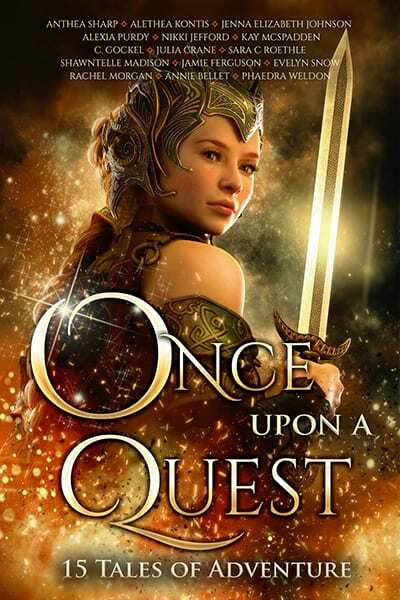 I was invited to contribute a story to the anthology Once Upon A Quest. Woohoo! I’m honored to have a story inside a collection with some other super cool authors! I decided to set my story in the Creepy Hollow world, and the first character who came to mind was Tilly. She’s always been a fun secondary character to write, so I decided to give her a story set in between The Faerie War (Creepy Hollow 3) and A Faerie’s Secret (Creepy Hollow 4). What I ended up with was … A Touch of Gold. Fifteen brand new fairytale twists from the bestselling and award-winning authors who brought you Once Upon A Curse and Once Upon A Kiss! With inspirations ranging from The Ugly Duckling to Snow White, and everything in between (including trips to Camelot and Oz), these fabulous tales are full of adventure, magic, and a touch of romance. IMPORTANT NOTE: This anthology will be widely available on all major retailers for ONLY TWO WEEKS. Thereafter, it will be exclusive to Amazon and go into Kindle Unlimited. So if you can’t or don’t like to purchase from Amazon, make sure to get a copy soon! Congratulations! That’s an awesome cover. I LOVE YOUR CREEPY HOLLOW WORLD AND THE WAY YOU RIGHT!!! You and your books are amazing,extraordinaire,and,wonderful and I have love every minute of it all!I hope you now how much I,and I’m sure others have enjoyed your books,and I hope you always write so everyone can enjoy your books as much as I have so thank you for the joy you have brought me? Hi Patrick 🙂 I think most of the stories would be appropriate, while a few probably aren’t. It might be best if you read the stories first to see which ones you deem appropriate for your granddaughter. Introducing … CITY OF WISHES! Elemental Thief (Ridley Kayne Chronicles #1) now available as an audiobook!